Feeding old horses in winter can be a challenge but, with the right guidance, you can keep your veteran horse in great condition. Here, Joanna Palmer BSc (Hons), Nutritionist for Allen & Page offers her expert advice. "Horses and ponies all age at different rates," says Joanna. "Some older horse can start to drop weight and condition, particularly during the winter months and may benefit from a change to a high calorie veteran feed to meet their increased nutritional needs. Others who have been good doers throughout their younger years will continue to need a low calorie diet to maintain a healthy weight and help prevent obesity." As Joana explains, fibre is the most important part of every horse’s diet. "In the wild, horses graze for 18 to 20 hours a day and to mimic this need to ‘trickle feed‘, our domesticated horses should ideally have fibre in the form of grass, hay or haylage available at all times," she says. "Fibre is essential for good digestive health and its digestion also provides a good source of calories and body heat as it is fermented in the gut. If a horse is not eating enough fibre, he will lose weight, regardless of how much high calorie 'bucket' feed he may also be fed." Unfortunately the natural decline in dental condition that occurs with age will greatly affect a horse’s ability to chew efficiently and it is then necessary to provide alternative sources of fibre. "Allen & Page Fast Fibre is a soaked high fibre feed that can be fed as a complete or partial hay replacer, offering similar nutrition to that of hay but in a form that is easy to eat." A good veteran feed will be one that is high in fibre and low in starch and sugar as this is more natural for the horse. "Feeds which contain a high proportion of cereals should be avoided as these have significantly higher starch contents than those which use fibre and oil as energy sources," says Joanna. "A high starch diet can not only cause fizzy and excitable behaviour, but it is also more difficult to digest and can make the horse more susceptible to developing laminitis or colic. Most specific veteran feeds including Allen & Page Veteran Vitality will have digestible energy (DE) values of around 11MJ/kg, which provides a step up in calories from most standard mixes and cubes. Veteran Light offers all the benefits of a low starch and sugar veteran feed, but with a much lower calorie level of 8MJ/kg – perfect for good doers." "Another important quality of a feed for veterans is that it is easy to eat," explains Joanna. "A veteran horse with poor teeth is more at risk of suffering choke and colic, simply because he is not able to chew properly. A feed that soaks to form a soft, palatable mash is easy to eat and using warm water also releases more flavours from the feed, helping to tempt even the fussiest of feeders." 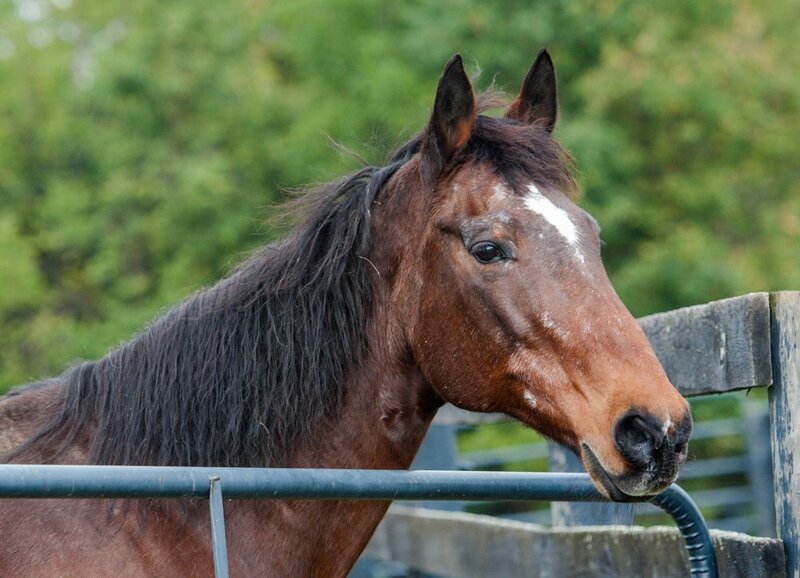 Feeding a soaked feed will also increase a horse’s water consumption, something that is particularly useful during the winter months when many veterans can be reluctant to drink enough water. Sadly with advancing age comes the increased likelihood of medical issues, many of which can be exacerbated by the horse’s diet. "For example, any horse with liver problems requires a low protein diet (e.g. Fast Fibre) in order to reduce the strain placed on the already damaged organ. Similarly, horses and ponies prone to or at risk of laminitis, including Cushing’s sufferers should only be fed feeds that have very low starch and sugar levels of under 10% combined (e.g. Fast Fibre and Veteran Light)," says Joanna. "Consequently, it is essential that all veterinary issues are taken into account when recommending feeds to ensure that the diet is suitable for the horse as a whole and not just in relation to his age." 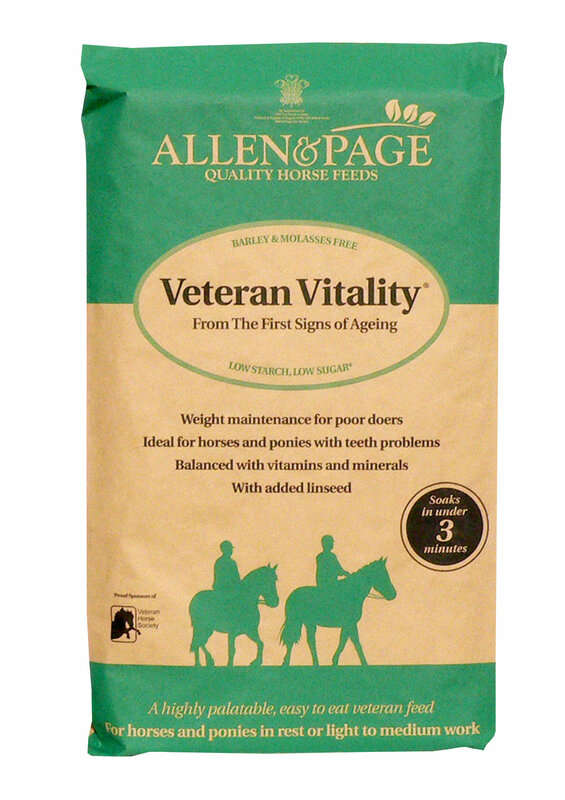 For more information on feeding veteran horses visit and to discover the complete Allen & Page range of feeds www.allenandpage.co.uk or call the award winning nutrition helpline on 01362 822902.